Suzuki Motor Corporation will make the world debut of its sleek and athletic Concept Kizashi 3 at the New York International Auto Show. True to its spirit of innovation and challenge, Suzuki is now moving forward with the third phase of its world strategy ― a phase in which it will enter the D-segment (midsize segment). The Concept Kizashi series was developed to reflect a "dynamic athlete in motion," taking its design cues from a strong, honed physique while displaying the performance, strength and style befitting a flagship vehicle. It symbolizes both Suzuki's future design direction and stated intent to enter the D-segment category. 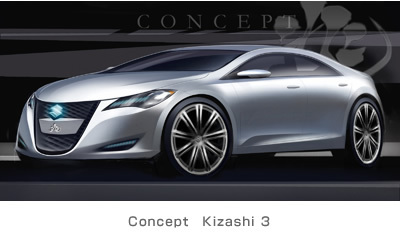 As the latest addition to the Concept Kizashi series, the Concept Kizashi 3 represents a closer-to-production vision of a future Suzuki sport sedan offering. The Concept Kizashi's "supersport" identity, a core component of the Suzuki brand DNA, is tempered by the design's overall　impression of strong, refined urban performance. The global reveal of the new concept will be joined in New York by the North American debuts of the Concept Kizashi and Concept Kizashi 2, marking the first time the complete Kizashi series has been publicly displayed together. The Suzuki booth will also include other exciting products that embody our "Way of Life!" message. The lineup will include production cars such as the Grand Vitara, SX4 and XL7. *The New York Internation Auto Show is open to the public from 21 to 30 March 2008. Press days are 19 and 20 March. Suzuki Press Conference: 11:35 on 20 March 2008 in New York (GMT-5:00).